Posted on November 2, 2010 Posted in 2010, St. John's, Weight Watcher's	. At first, this update was going to start with details on the many things that have been happening over the past few weeks. Soon enough I realized that there was plenty of details to make it a separate blog update. I’ve since created another draft and will post again later this week. The main purpose of today’s update is that I missed noting an important anniversary. On October 20th, I celebrated my one year anniversary of being a Weight Watchers Lifetime Member! 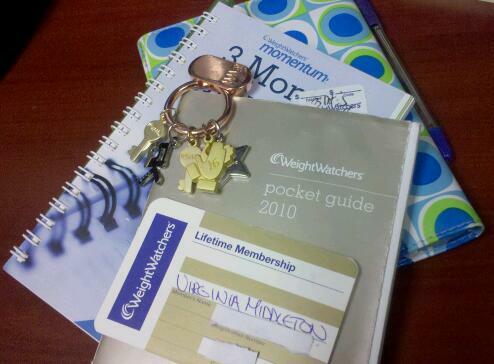 It was back on April 21st, 2009 that I attended my first Weight Watchers meeting in Toronto. The meeting Leader, Lindsay, was a perfect leader for me – she was positive, full of energy, and wanted everyone at the meeting to feel good about themselves. One of her main focuses each weeks ensuring we knew it was important to her that we all reach our personal goals (no matter how big or small they were). If that meant talking about breakfast alternatives, or discussing what alcoholic drinks to avoid (not stop drinking all together, but helping us avoid the high calorie stuff). She struggled for a number of years with weight loss and was so happy being at goal and living a healthier life. It wasn’t easy, but by tracking what I was eating (and staying on top of my points count), becoming more active (and discovering I love to run), and attending the meetings are the main reasons I was able to reach my goal. Of course having a supportive husband was also handy since it meant we had to change a lot of our eating habits, but it was a win-win for us both in the end. Weight Watchers also help me to understand my body’s food preferences. It also allowed me realize that some foods are just going to “stick” with me longer than others, so it’s better to make a healthy choice and not feel like I’m starving later than to always go for the greasy short-term food. I’ve also discovered that there are so many great recipes out there that are pretty healthy, but you’d never know it by how tasty the end result is on your plate (and in your stomach). Posted on October 17, 2010 Posted in 2010, books, Bull Pond, Knitting	. I’ve written before about my parents’ summer home, but it’s not something you can cover once in just a few lines. We’re here again on the weekend and you can feel the weather changing. It’s not as warm as it was a few weeks ago and the wind has a dampness that hints of the approaching winter months. It’s even quieter down by the water because the weather isn’t ideal for the noisy boats and disruptive SeaDos that dominate summer weekends. But when swimming and sun do not matter and you just want to get away and go somewhere to relax, then here is where you want to be. Yeasterday, Matt and I went to a wedding where the groom is someone I know from high school. He’s a professional photographer and in the highest level of Murphy’s Law, his own wedding’s photographer cancelled at the last minute. As a Plan B, he asked myself and another friend if we would take photos while using his camera gear and following his guidance and instructions. It was an interesting experience, but I’m definitely not planning a career move any time soon (read: EVER). Today, it’s all about me and a need to relax. While I don’t mind spreading lime or digging holes to build on the landscaping of our second home, I’ve decided to take it easy after a busy week at work and a very full day yesterday. Question: can you tell when enough is enough and you’re in need of some “me” time? Since last night, I’ve accomplished a lot. I managed to finish off (including sewing in the ends) the green basket weave baby blanket I started a few months ago. Two friends have already tried to claim dibs on it and we’ve all agreed it goes to the first baby. On Friday I started a lovely seed stitch cowl (there was a debate amongst friends on whether it was really a “neck tube” or a dickie instead of a cowl) and finished it off last night. 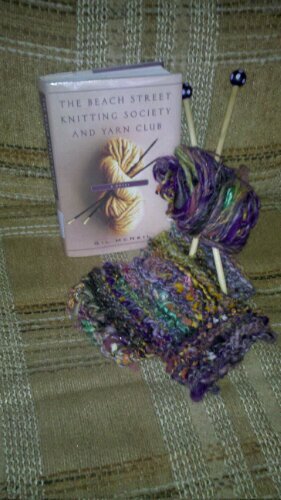 And today I started another cowl that was from some local yarn made up of multiple fashion yarns. Yarn for both cowls were bought on Friday from A Good Yarn, a local knitting store in downtown St. John’s that’s simply fabulous! More about that later though as I’m long overdue a decent knitting update here. For the first time ever, I find myself somewhere and I’ve run out of yarn/projects in the near vicinity… how shall I ever cope??? ?By reading more pages of The Beach Street Knitting Society and Yarn Club by Gil McNeil. I’m only 80 pages out of 404 in, but love it so far. When life starts to feel ragged at the edges or you just need to recharge your batteries, what’s your strategy? 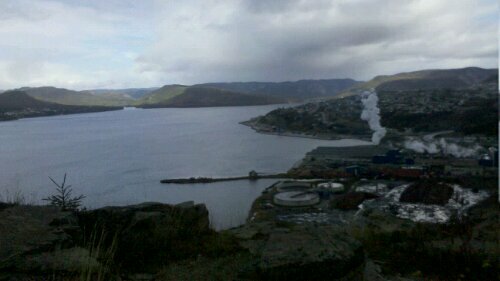 Posted on October 10, 2010 Posted in 2010, Friends, NL, Photography	. On Friday, Matt and I hopped in our car and drove out to Corner Brook to visit our friends Sabrina and Aidan. It was Sabrina’s birthday last week and Aidan sent a message to all of our friends in St. John’s suggesting people come out for Thanksgiving as a surprise. So we took a day off on Friday and made the trek for the first time. More details about our trip later, but for now you can enjoy this photo taken yesterday at Captain Cook’s Lookout. Posted on October 5, 2010 Posted in 2010, Family, Food, NL	. When you hear the term “flipper dinner” what do you envision? Or you’re now elated because you envision a water-bound dinner that has that cute and lovable dolphin we all watched on TV attending a pool party. 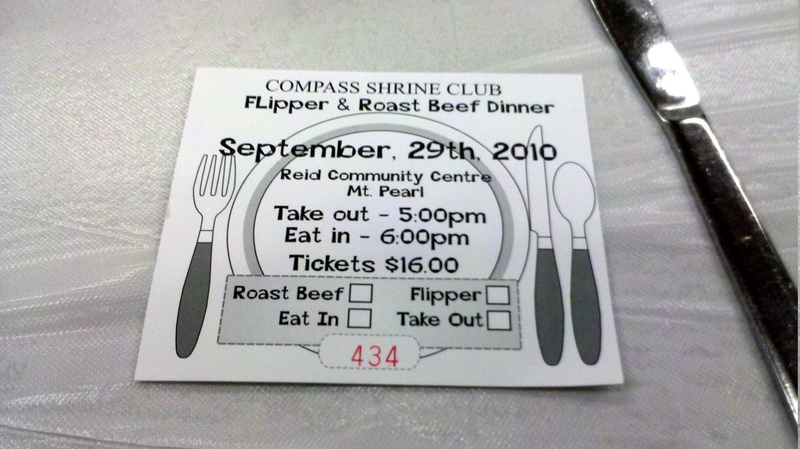 Well guess what – in Newfoundland and Labrador, the term “flipper dinner” involved the consumption of seal flippers. Yes, yes I know – “oh it’s wrong… how can you do that… but the baby seals are so cute!” I’m not here to debate the moral issues some may have about this type of meal, instead I want to tell you about how yummy and tasty such a meal can be if you keep an open mind! Last week Matt and I went to Flipper Dinner that was organized by my Dad’s Shriners group (you know, those guys that wear the red fez hats? My dad is one of them!). Neither Matt nor I have had flipper before and while my grandfather is a huge fan, my brother (who historically growing up was a picky eater) is a BIG fan of flipper. Even though my brother is currently living near the Boston area these days, just knowing he’s enjoyed flipper was a big selling point in my eyes (he is my big brother after all). So my husband (who’s originally from Ontario) and I went with my grandparents and experienced seal flipper for the first time. Someone mentioned to Matt had flipper can be rather fishy tasting… I’ve heard it can be really oily… But we both agreed it was neither that evening. 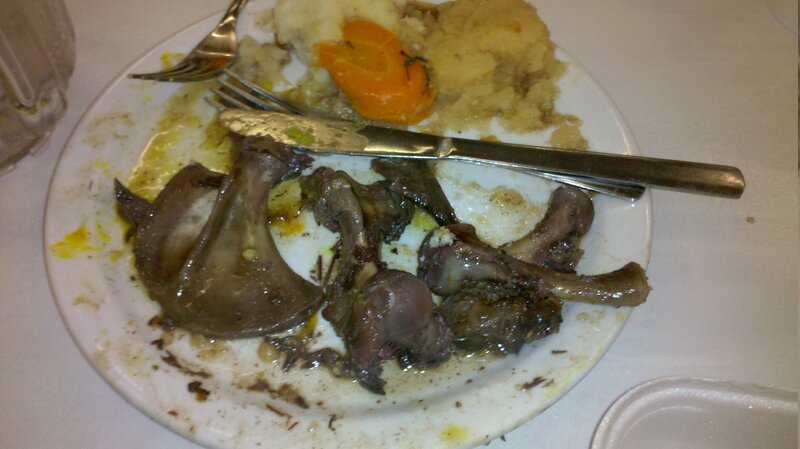 In fact, the most smell we could get from it was a faint liver-like aroma. Clearly the Shriners did something right. Flipper is basically a dark meat and (in my opinion) tastes a lot like Turr (a small seabird more well known as a Common Murre). Now I’ll admit it was a rather rich meal and I certainly wouldn’t want to eat it every week, but overall I have no complaints about the experience and I’m really glad we went. In fact, if they do it again next year (and it’s a traditional fundraiser for a lot of churches and community groups in St. John’s), I’ll definitely want to attend this same one because they knew what they were doing. I’ve asked around and there seems to be a trend that you either love flipper or hate it. And there’s a distinct separation amongst the flipper lovers on whether or not they’ll eat straight up flipper or if it has to be in the form of flipper pie (which sounds very nom nom nom to me!). Either way, it was a lovely evening had by all. The fundraiser was a big hit and is now tucked away as a fun family memory. 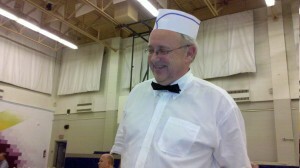 Here’s my dad as one of the excellent servers during the evening’s festivities. Thanks for reading and I hope you won’t judge me too harshly on this recent meal decision. 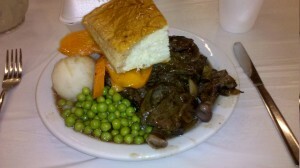 To read about Matt’s experience with Flipper Dinner, check out his recent blog entry about it. Have you ever had flipper? If not, would you if given the opportunity? If not, is there anything exotic or unique out there that you haven’t tried yet that has left a curiosity lingering in the back of your mind? formed in San Francisco, California in 1979, continuing in often erratic fashion until the mid-1990s, then reuniting in 2005. 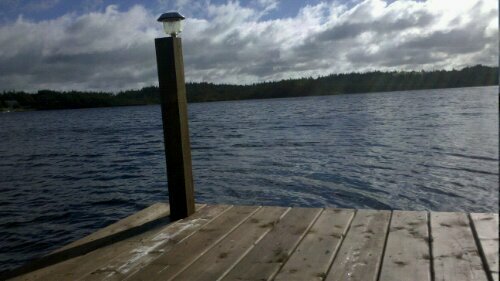 Posted on October 3, 2010 Posted in 2010, Bull Pond, Family, NL	. Everytime we come up to Bull Pond where the family summer home is located, I’m always reminded of how lucky I am to have a place like this. Not only is it an escape from city life and a personal space in nature, but it’s only 40 minutes away from our current home. We’ve had this land for over 20 years and it’s come a long way. There’s always a project happening and something to do, but it’s established enough that you can have a comfy place to stay if the weather doesn’t hold. I practiced my meditation techniques from Thursday’s class down by the pond this morning . It went really well and I’m realistic that meditation takes time. It’s a new “place” for one’s self and you can’t just go barging on in expecting a life-changing experience . Here at Bull Pond though, I’ve always felt a special connection, so it was a lot easier to connect with myself and the environment around me. Do you have a place to call your own? Maybe it’s not a summer home, but a place in your community that you hold dear; when you’re there everything feels right in the world.